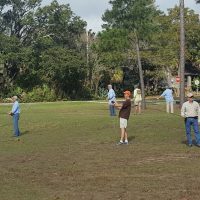 My local fly club is called FFNWF (Fly Fishers of North West Florida). Now that is a mouth-full without vowels but still not quite Hebrew. We just love our abbreviations here, but I can tell you that it takes a while to understand them. Especially if English (American?) is your third language. Some abbreviations are simple and ubiquitous like the OMG! exclamation that is now being used even in Icelandic parlance. What the heck does POS mean? Or NYOB – PAWS and on and on. So, here’s my advice to the natives – go easy on those abbreviations when talking to a non-native. But I digress. When I first saw the term “Casting Clinic” in our monthly newsletter I was not sure what it referred to. Casting could refer to fly casting, but it could also mean shaping a plaster of Paris cast. The clinic part implies some medical endeavor in my understanding. 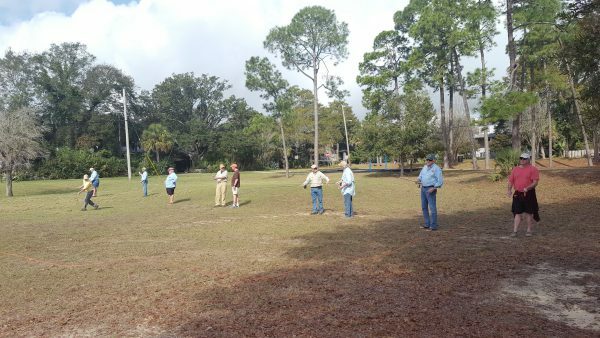 But what I discovered, was that it means club members get together and wave their rods. The idea is that we supposedly teach each other, especially those who are starting out. Then we can show off a bit by banging out long casts with sharp pointy loops (Yup – guilty as charged). 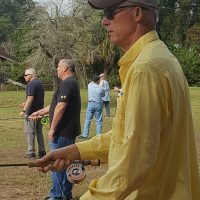 As I have been sucked closer and closer to the black hole of teaching fly casting, I realize that this way of preaching probably is not a very effective way of converting beginners to intermediate casters or intermediate casters to good ones (to become a great caster you need private lessons!). So, this year we are running an experiment. 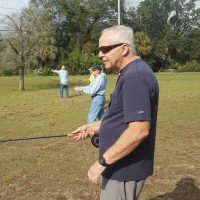 I plan to introduce one special fly casting drill/exercise every clinic during the year. 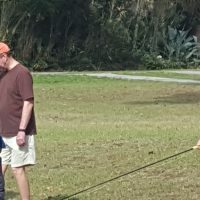 The February clinic was devoted to the pick-up and lay down cast. 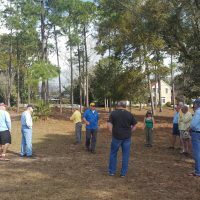 We had a good turnout – around 20 casters with several new faces, which was heartening. When we commenced I got up on my soap box and explained the basics of the cast to the group. 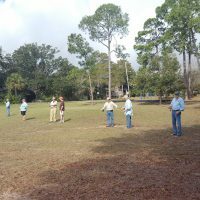 Then we divided the group into subgroups of two, with one experienced caster in each, and set off to practice. 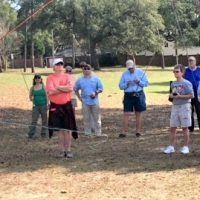 I was a libero (soccer speak – for a player who is undisciplined, so he gets to roam around) and went from group to group running my mouth and praising technique or correcting small errors, etc. We focused on just this cast for half an hour, until it became apparent that the group was starting to lose focus. Then we reassembled in the larger group and went through the components of the cast. I was rather pleased with this first lesson and I hope that the next clinic will have a good turnout of students, especially new ones. These clinics are open for all comers. This is a basic fishing cast, and we will break it down into its components. Its purpose is to unstick the fly from the water surface (the lift part) and cast the fly out again (the subsequent parts). We start casts by lifting the rod tip until the casting hand is at breast height. We do not rip the fly line from the water surface since that will scare the fish. 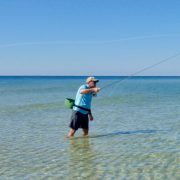 When we lift the rod tip you will notice on the water that the fly line clears the surface and runs away from you to the leader. That is when you commence the casting stroke. Pay attention! 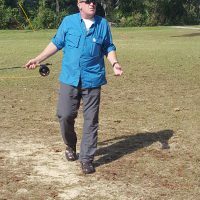 If you wait too long the fly line will sag again to the surface. The idea is to have just the leader in the surface. 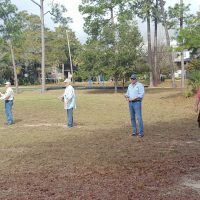 We start with fly line (30´ – 35´) and leader (7,5´) straight. 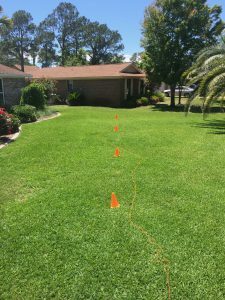 There should be no slack in the line. now we flick the rod forward (pat) and stop the hand at 10 o’clock. The line and leader straighten, and we let them gravitate/float down to the surface and let the rod tip follow. 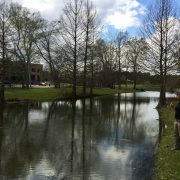 Last weekend I was invited to the Magnolia Fly Fishers in Jackson Mississippi. The idea was that I should give a short presentation on salt water casting, since the Magnolias are headed to the salt in April. Then we would practice the various casting scenarios. Head wind, tail wind and cross wind. I have been working with Cynthia Low their president towards certification with the IFFF, hence the invite. If you check their website you will find this teaser. Ok, it’s not really a black tie event, but it needed a name so I named it my favorite name. I keep hoping someone will show up in a tux! 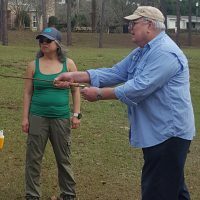 Cynthia, La Presidenta of our club, has invited IFFF certified casting instructor Jonas Magnusson to come to First Baptist Church of Byram on SATURDAY March 18. 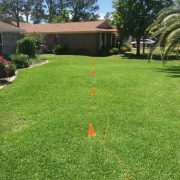 Jonas will also be providing for “fee” lessons, $50 per hour club special. This webmaster has signed up for one hour. I think he may be available on Friday for this as well as some Saturday. Call Cynthia to book your appointment. Jonas is from iceland and is an expert in spey and switch rods and I think we may get a chance to cast one or at least get a demonstration. Jonas has a website if you would like more information, Every Jonas has a Whale . Who wrote this beauty? This blog practically writes itself. I am not Swedish but my paternal grandmother was, and I speak that lingo, so what the heck. 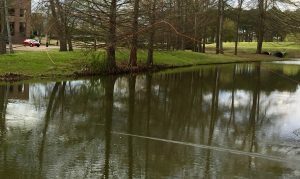 I started late Friday with Cynthia on roll casts, and we had a nice little pond to practice on. She has put in the hours, and she is nearly where she need to be (see pics). “Jonas says he’ll travel anywhere in the world to teach…even Mississippi USA. Yes, we have fly fishers. Yes, we fish all species and for a short 4 hour drive we have access to some of the best fishing in the world, the Gulf of Mexico. 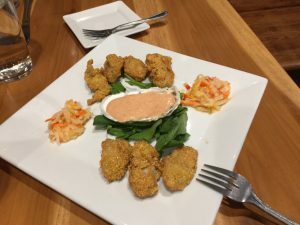 Imagine a small town church tucked away in the wilds of rural Mississippi, light breeze, cloudy sky, and a deep fryer of oil warming for our fried catfish lunch that awaits us after the sessions with Jonas. 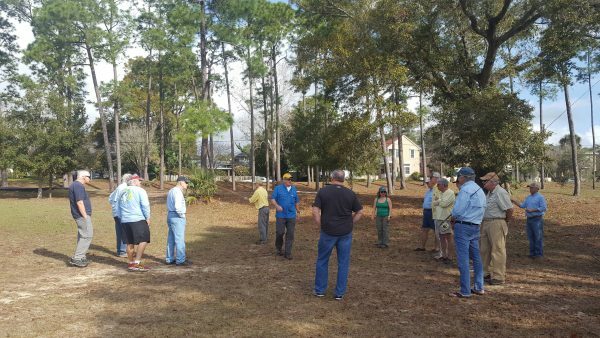 Club members give fishing reports, present future outing details; the meeting a bit sluggish then “UP! Let’s go cast” like a sergeant barking orders wakes the crowd. Every man and two women head for the field, rods in hand. We line up like soldiers. Southern accent communicating with Scandinavian accent; everyone listening intently to every word and instruction. Jonas moves person to person with a tip here and an instruction there. Next are group commands. Once again we line up. Now let’s cast to the wind. Wind changes, another command, and we line up again. Lunch! That fried catfish is calling. We take a break. Jonas eats like a bird, said one. That’s why he has his figure and we have our figure; we like fried catfish, slaw, hush puppies, turnip greens with fatback, ketchup. Onward! Jonas continues with his individual students who booked an hour. 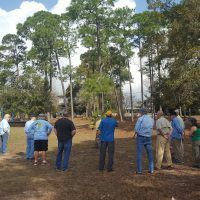 Club members being club members, the one on one became one and a gallery. The afternoon whiled away as student, teacher, gallery became one unit. Each member helping the other as knowledge and understanding grew. Prodding, poking, laughter, and challenge punctuated the afternoon. Success! We had worked off those fried catfish calories. Jonas survived Mississippi and made it back to Florida. He’ll go anywhere to share his passion and love of the sport. 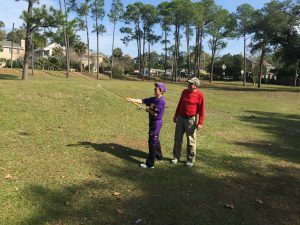 Every club should have an event that includes a certified instructor. It’s worth every penny and the benefits last a lifetime. If you’re not in a club, consider joining. It’s an enriching, encouraging, supportive experience. Glen Davis gave me his stripping basket that looks very promising. You wear it on your left hip and strip into it. Will get back with you on that one when tried. Glen also wrote about my teaching. 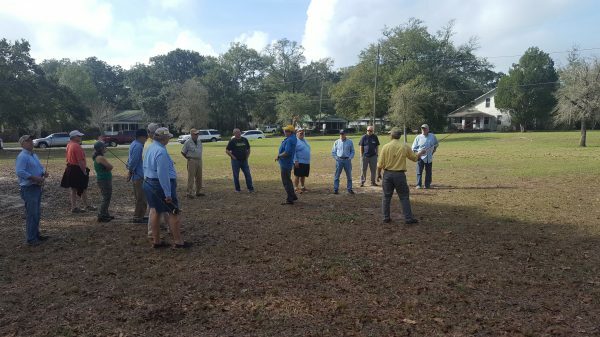 Well there it is and I thank the Magnolia Fly Fishers for inviting me, and I surely learned a lot more from them. The best way to learn something is to teach it. 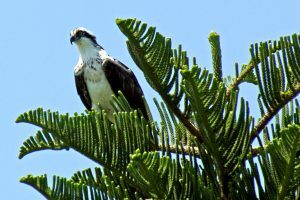 A fly fishing set up is costly. Let’s look at the ingredients. The fly itself isn’t so expensive, especially if you tie one yourself. Let’s say that it costs 5$ a nice round number. Now we need a leader and we peg it at 5$. 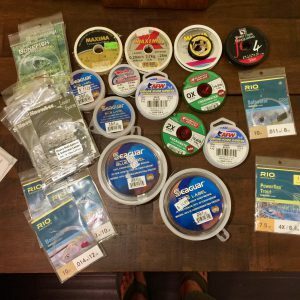 On to the fly line itself, and we can easily fork out somewhere from 50-100$ for a quality fly line. 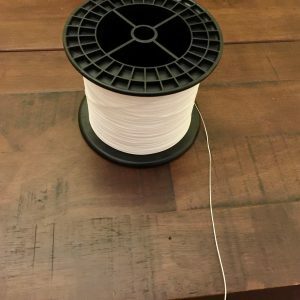 The line is connected to the reel through to the so-called backing, and we spend 5-10$ on that. Now for the reel. They come in a lot of different prizes depending on quality, brake power and size. 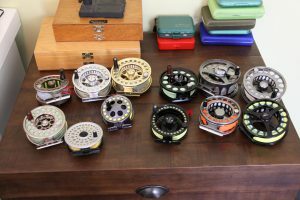 The cheapest reels that are useable retail around 100$, and then the coveted quality and bragging rights reels will take you to 1000$. Let’s put a 200$ reel on our outfit. Then there is the rod itself. I like to organize them into 3 levels of cost. Entry level rods cost up to 200$. 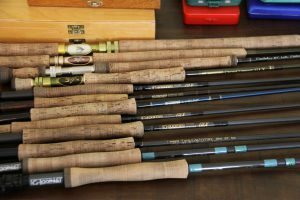 Mid-level 200-500$ and then the top-level rods retailing for 500$ and more. By and large the expensive rods will prove to be the best in the long run, but there are some exceptions. This will give me an estimate of (5$ fly + 5$ leader + 50$ backing + 100$ reel + 200$ rod = 360$ low estimate to 5+5+50+500+500 = 1160 high estimate). 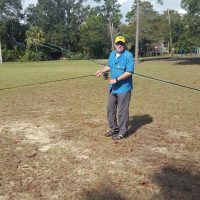 Most fly fishermen have several rods let’s say three to multiply whatever cost there is in your setup. These are just some numbers, but we can safely agree that the total cost for a fly fishing setup for the individual angler will be in the thousands. Now fly leaders and fly lines will wear out and we replace those as we go along. The rod craze is there too. The industry wants you to buy the latest model and by reading the ads you become certain that this one will cure all your casting ailments, right? Then there are the reels. Large arbor – sealed drag and what not, but you got to have it. 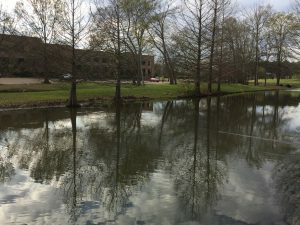 Now there is the cost of the fishing license. Fortunately, this is not costly as a rule but if you want to fish some private waters or hire a guide, it is going to cost. 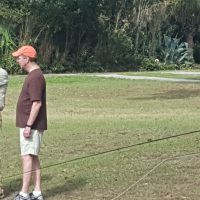 I am in contact with some guides here in Florida and they all agree. Most of their clients, despite labeling themselves as fly casters, will have significant problems casting in the salt. 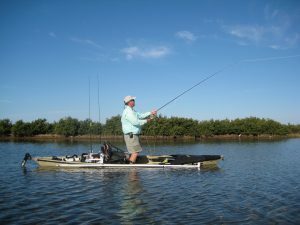 Think about it – travel to Florida – hotel – food – guide – plus your equipment and the fly does not get out there. Most people cannot cast the fly. There are several reasons for this but it does not alter the fact that most people are terrible casters. On small streams, it does not matter much you bungle it out somehow, and the current will straighten your line and you are in business. With any kind of wind, it will become a total disaster. Here in the salt on the Gulf shores this becomes painfully evident. 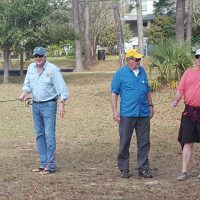 There are many fly fishermen that have been fishing for years in rivers and lakes but will realize that when fishing the salt, they just cannot do it. However, the biggest reason for this is that people do not seek lessons. I know for instance that just three lessons can help an average caster to become a very good caster. The essentials are going to be the same for a very long time, so good help can last you for life. 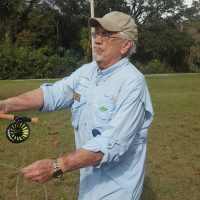 When you look at the cost of the outfit fly anglers flesh out, it is hard to presume it is because of the cost, but people still do not seek proper instructions. There are of course some great casters that have figured it out on their own. 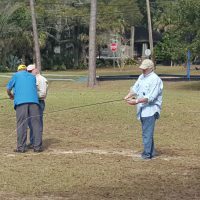 Most casters have had some help from friends and fly fishing clubs including me. This type of learning is however fragmented and haphazard and is not based on a platform of knowledge. There is a program run by IFFF whereby budding teachers are taught a certain system of basics. They are then tested and vetted by IFFF. 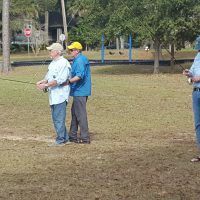 This way of organizing is proven, and ensures that the licensed casting instructors have a common basis, and this basis is proven as a sensible platform to teach fly casting. When I started studying in this program (and I was a decent caster at the outset) I had no clue about the 5 essentials. I had inferred something like that during my trial and error stage that became needlessly long. However, when presented with the curriculum of the IFFF program, I made a quantum leap in understanding, and my cast was seriously improved. It took a master caster a day’s work with me to get me to the next level. On basis of that teaching I have been improving my cast little by little. The students that I am now teaching seem to make speedier progress and I find it easier to teach them and diagnose their ailments. The other important item you cannot buy is a knot. In Iceland I just fly fished rivers and lakes. 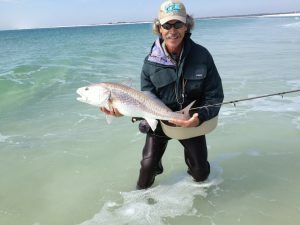 I did not fly fish in the salt there and I doubt that it will ever become a big sport. The North Atlantic is just so cold and the waves are unforgiving. I moved to Corpus Christi in Texas in 2007. There are few rivers there with the type of fishing with which I was comfortable. I passionately hate fishing in discolored water. That lead me to fishing the Corpus Christy Bay and the area south east of Shamrock Island and it took me a long time to figure the salt out. There were not at that time many fly casters there. 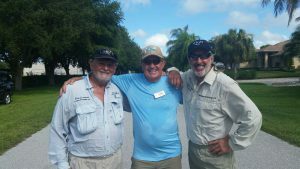 I teamed up with a local guide Steven Utley and he taught me the area and I helped him with the casting. I mostly fished from a sit on top kayak and cast sitting down which takes some time getting used to. 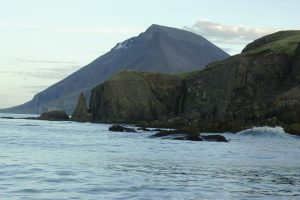 The area south east of Shamrock Island was perfect for kayak fishing and I loved floating around the area taking in nature and fishing. 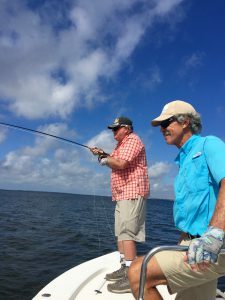 There is a channel there from the Bay into the Gulf with breakwater structure on each side from which I fished and there I got connected to my first Spanish Mackerel and have come to love fishing for them. I did not try my luck in the Gulf itself while living there. IN 2009 we relocated to Gulf Breeze Florida (south of Pensacola). 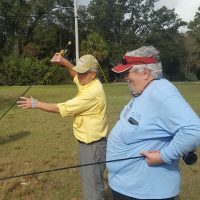 There I have been fishing with my friend Basil Yelverton a local guide and from that experience (plus Texas) we put together an iBook (see Books page). Fishing the salt is very hard because everything is moving. The boat is rocking the fish are busy going every which way and then there is the blessed wind. 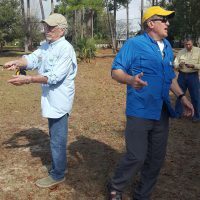 Experienced fly casters from fresh water scenarios are known to have a meltdown when they realize that they cannot cast at all in these conditions. At any rate it became painfully apparent to me that I had to up me game in order to be able consistently to cast from a boat in the wind and all that. So I did just that, pouring over YouTube and websites – basically self-taught. Cast until my arm was falling out of it’s socket and then cast some more. There are some very good casters here but most local casters have difficulties in the salt. The usual resultant reflex is to tie “the top secret classified nuclear fly” that is going to save them. It does not matter which fly you have if you cannot get it out to the customers. I hope we will slowly change the emphasis onto casting. 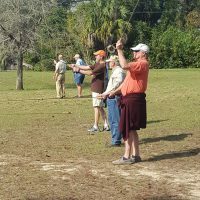 Others and I have been busy teaching casting at so-called monthly clinics for the Club members. My friend Baz noticed that I was becoming a better caster so he suggested that I do the CCI with the FFI. “What is that”? I had no clue. I researched this a bit and since I am retired this could be a good niche for me. 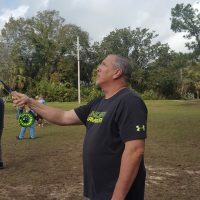 I have been teaching my whole life (coaching sports – teaching med. students – teaching residents etc.) so this would be somewhat in my comfort zone. 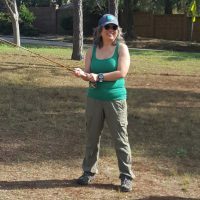 I decided to go for it and became a member of the Fly Fishers International (FFI). Contacted their office and was guided to a certain MC (master caster) Leslie Holmes as a possible mentor in February ’16. We spoke on the phone and were instantly on insulting terms and he took me on. He sent me a ton of stuff and more practice ensued. 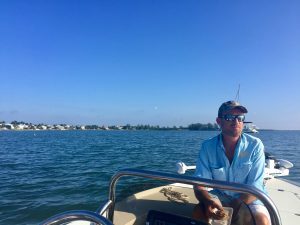 Then we had a weekend session in Boca Grande in April. Well that was quite the eye opener for me. I could cast some he gave me that but my faults were many and varied and mercilessly pointed out and corrected. 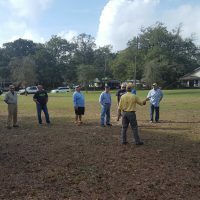 After that I returned to the Panhandle with more practice and we scheduled a tune-up and a practice session in late August. 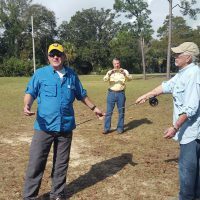 The goal was to become a certified fly casting instructor (CCI). Three days before going again to Boca Grande Leslie calls me and asks “are you ready”? Sure I am ready my arm is falling out of the socket but I am ready. Leslie arranges to have me tested Sunday 8/28 and off I go. We had a dress rehearsal on Saturday where I suddenly got ripped a new one. My problem was/is overthinking and being a bit of a nerd I was too verbose. When I understood what was expected I reworked my answers to the various tasks on the test and made ready. It must be handed to Les that after he had deconstructed me he built me right back up. Sunday morning I meet Captain Pete Greenan and Captain Rex Gudgel my examinators. They quickly settled all jitters and I passed the test. 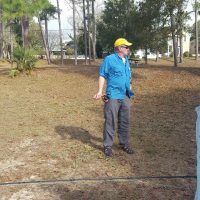 I have been involved with teaching and testing In Iceland Sweden Scotland and once in Africa and I can tell you that Pete and Rex were very competent and the whole process well thought out and solid (mainly because I passed). Les’s teaching was spot on and I plan to work with him again. I have certainly made some colostomies in my time but not with the finesse and elegance that Les does it. But Les my patients were always under anesthesia.